Upon investigation it turns out that this is a site called http://googlegooglegooglegoogle.com/ set up by "two guys named Alex and Erty decided to purchase the name and create some sorta site using it" - see article about this here. At first I thought this was a hack into Google, but a quick look at Chrome History shows this was accessed by someone (Vicki and pals) using the computer last evening - my iGoogle settings restore the pages that were open last. Isn't it strange that I was automatically suspicious? I was careful not to click on anything for fear of doing damage. I even searched for "googlegooglegooglegoogle" on a separate tab to see if it was related to any hacking or security breach at Google. All it is is "Alex and Erty" using frames to position four Google search windows on one page so that you can search for four items at the same time. 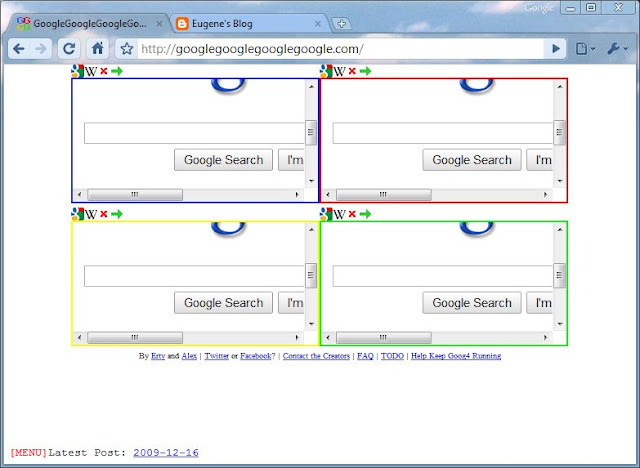 If you load googlegooglegooglegoogle into each of the four frames you can search for 16 items at a time. Full marks for innovation and creativity, though I'm not so sure how useful this tool will be. It just shows that there are creative developers out there looking for new ideas all the time - keep it up "Alex and Erty".